It’s a new month and time for another TBB Asks. 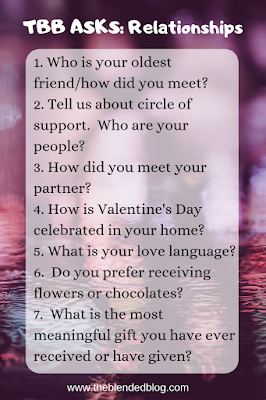 This month’s theme is relationships. So let’s get right to it and talk about them. My oldest friend — well, let’s call her the friend I’ve had the longest, because she is my age and certainly not the oldest, is my friend Kayci. I’ve known her since we were in class together in elementary school. She got me interested in the school choir, and theatre, so I’d say that I have a lot to thank her for. And even though she’s moved several hours away now, I love to keep up with her via social media. My circle of support isn’t something I’ve put much thought into, tho honestly, it’s probably just my family. I’m pretty lucky. I got a great family and I married into another one. They’re always there if I need something, particularly with my favorite tiny human. My mom and mom-in-law even took Mil for about 3 days last December when the hubs and I both had the flu. It may seem a bit odd to some people, but I have no memories of actually meeting my husband. Our parents were pregnant with us at the same time. As a matter of fact, I’m just 6 days older than my husband, and when we were born, his family lived just up the road from my grandparents. So, even before I knew who he was, he was always a presence in my life. I can’t remember the last time we did something for Valentine’s Day. It was probably when we were dating. Because, honestly, Valentine’s weekend is always the same weekend as the Farm Show in Louisville, so the hubs is out of town. I guess we could always do something at another time, but I’m not big on cut flowers, and I can get my own chocolates. At our house, we just have more important things to do. I’m a gift giver. If I see something that reminds me of someone, or that I think they will love, I often just get it for them, holiday or not. As I mentioned before, I’m not really partial to receiving flowers or chocolates. If you want to impress me, get me a book. I would have the hardest time picking out the most meaningful gift I ever received, but if I had to pick something to mention for this post, it would be the family heirloom locket that I wore as my something borrowed at my wedding. After the wedding was over, my grandmother told me to keep it. I still have it, and actually wear it on occasion. It still has the photos of my great great aunt Bertha and her father in it. As far as the best gift I’ve given, it’s probably the photo book I made for my mother, which has pictures of her mom in it, along with all of my grandmother’s poetry. You’re stuck with me for life! I love that your husband has been in your life since forever- that makes a cool story! Thanks for linking up with us! Thanks so much for stopping by! I love doing the TBB Asks each month. 1. OIdest friend: my first tutoring student, Conchi. She went to college kind of late (25) and we’ve known each other for about 20 years. I consider her my best friend, though I know she has a bestie she grew up with. But we’ve stuck together through thick and thin and never quarrelled, though we don’t always agree on everything. 2. Support group: Husband, Conchi and maybe one other friend. I’ve just been through the devastating experience of realising that the group I thought would be “there for me” could actually care less whether I’m there or not. The group is a very small “church”…so, yeah. Having attended for 8 years, it’s been growing on me for the past 2 or 3 that I was surplus to requirements. Startling to realise how true it is. 3. How We Met: I walked into his office and there he was. He looked up and said, “Yes?” and I felt like someone had hit me in the solar plexus. Hard. It was a travel agency, my roommate’s airline had gone bust while she was here, and she had a six year old son with her. Not only did he sort out the problem, he drove her to the airport and married her roommate! By our second date, it was a done deal, we were engaged. That was 36 yrs ago and I’ve never regretted it for a single moment. 5. I’m very verbal. I like to say what I feel if it’s positive! If I don’t talk to someone, you can bet they make me uncomfortable. Conchi says she can always tell if I’m not enjoying a party or gathering; I get helpful. Start carrying stuff, picking up dirty dishes, even doing the washing up. 6. Cut flowers are a luxury here, so if I have to choose I’d go for flowers, but a) they don’t last and b) there’s a dozen other things I’d rather have—like just about anything from the Lush store!! I do love colognes and scented soaps and bath gels. 7. Most meaningful gift: Probably our apartment, our little haven. When we got engaged, rings weren’t a thing in Spain, so he gave me the keys instead. My parents almost refused to believe we were really a couple, until he wrote a letter detailing his salary, prospects etc.